WHEN Moses Penias decided to become a health worker, little did he know that one day; he would be in the shoes of parents who have children with medical problems. Penias is Community Health Extension Officer who previously worked for the Catholic Health Services at Palia hospital on Lihir Island. He now works for the Lihir Medical Centre. This is the story of his little son Elias Moses Penias. After nearly three years of reviews and continuous medical attentions, his problem was finally resolved. Elias Moses Penias was born on the 30/07/2009 at the Lihir Medical Centre and his problem was not detected until at 9 months after having continuous chest infections, it was revealed that he had a heart problem. 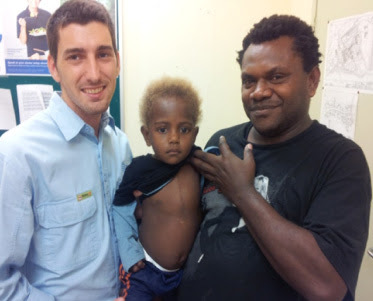 The doctors at the Lihir Medical referred him to the Port Moresby Heart Institute where he was scanned by Dr Tefuarani. From the scan result, he then advised us to come back the following year for review and surgical corrections by the Open Heart Team during their visits to the country. In 2011, we were referred in again, and this time he was reviewed by Dr Tefuarani with Dr Hawker from the Children’s Hospital Westmead NSW. After discussion on the scan result they suggested that he needs to be operated elsewhere and not in Papua New Guinea, as his case was more complicated. With Dr Oriol on this side of the line he went through all possible venues that had children’s heart Hospitals and after all the negotiations ,Dr Hawker and Professor Winlaw at the Westmead children’s Hospital , Sydney agreed to do the case there. Funding for the operation was again a problem, but after requests made by the ISOS medical team, LSDP and Newcrest funded the bills which included the accommodation, airfares, and the medical costs. Everything went on smoothly without any major hiccups, from processing of our passports and visas, the airfares, the accommodations and the Surgery for our son. The Quality of Health care that he received there was awesome and thus post operatively he did not have any complications and his wounds healed up nicely after a week. Lastly to friends and relatives around PNG thank you all for your prayers, and May our good lord continue to richly bless each and every one of us.